Covering the movement from its conception, when a few urban guerrillas joined with indigenous leaders to plant the seeds of revolution, Muñoz provides an intimate and well detailed text. The Fire and the Word chronicles Zapatista history through the first 10 years of mobilizing a resistance in the mountainous and remote rainforest of the Lacandon Jungle; to the armed uprising against the Mexican government in 1994; and the negotiations, international relations and self-governing process that followed. As the title suggests, the praxis utilizes both the fire and the word. The book distinguishes between three main strategies that developed in the movement: the militaristic and rebellious actions of “fire,” the negotiations and global communication strategy of the “word,” and the organizational process that is the backbone to it all (283). The Zapatistas rhizomatic structure and global communication methods provide an example for anarchism in the 21st century. In the Sixth Declaration of the Lacandon Jungle the movement is declared as anti-capitalist and shows solidarity with all fighting neoliberal globalization. The book is described by Marcos as a giant tapestry filled with “those little pieces of mirrors and crystals that make up the history of the EZLN.” In these mirrors, the reader may see parts of themselves reflected. But the Zapatistas believe every person, and every movement, must grow through their own experience. Therefore, they offer “a mirror that isn’t you, it just helps you see how you are” (307). From her participatory perspective, Muñoz has provided a comprehensive understanding of the movement that will keep the knowledge alive for generations to come. The Fire and the Word is a must have for those researching Zapatismo and a nonauthoritarian world. It is impossible to come in contact with commercial media and not be exposed to the specter of criminal justice as entertainment. Turn on the news and you can see car chases. Turn on afternoon fare and it is syndicated reality shows featuring people being chased down by police. Primetime offers serialized prison action-adventures, courtroom procedural dramas and yet more reality shows of sassy judges, valorous cops and children wheedling their way through the juvenile justice system. Crime, punishment, but not the root causes, are today part of the lexicon of distractions, and a book argues society is far worse for it. In Ohio University instructor Michelle Brown’s book, The Culture of Punishment: Prison, Society and Spectacle, the treatment of criminal justice as spectacle — as well as more insidious methods, such as making surveillance a televised affair — contributes to its devaluing, especially for classes of people least impacted by it. Brown’s scan of these matters is fresh and important for people to grasp. Race and class distinctly define how people experience the criminal justice apparatus. In her view, those most removed from the jarring realities of law enforcement, trial and incarceration — white, middle-class Americans who do not endure the experiences of economically disadvantaged people of color — become passive supporters of the abuses heaped on these communities. The treatment of criminal justice as a television drama or a video-game title further desensitizes the population from precisely how brutal and unjust some practices are for other people. Thus, prison, corrupt police and unfair trials to whites may seem like the stuff of fantasy or, even worse, basis for street cred, but for Blacks and Latinos, such issues are real and can (and do) result in broken families, death and years in confinement. Yet more appallingly, are the ways race and class shape the experience, both affect how society judges perpetrators, crime and punishment. To upper-class whites, who may lack the experience or clarity to understand convicting someone’s son, brother, father or husband to 20 years in prison is, in fact, two decades of life, believing in the sanctity of the law has a different gravity than for those who have historically faced discrimination, mistreatment of family and friends by the system and may not believe the philosophical foundations of equality and fairness never apply to them. Amid pundits and politicians demanding tough-on-crime jockeying, the full application of that intolerance is on display. What the callousness means in a few generations, especially if historical divides continue, is yet to be understood. Brown’s way of telling these stories packs a real punch. While many researchers have plumbed for reasons why race and class so divergently distinguish life in the United States, The Culture of Punishment puts forward new information boldly and in a way everyone can understand. I was listening to a radio talk show recently where a caller complained about getting a National Rifle Association telephone ‘poll’ that consisted of one question, with the phrasing being something to the effect whether participants believed Hillary Clinton and friends were coming for their guns. The host and caller laughed about the misleading essence of the poll, but what was at issue — the way the NRA positions itself as a guardian of American values, and, more vitally, how it portrays its reputed opponents — did not really get a treatment. Liberals generally think of Second Amendment types as gun crazies, intent on saving their rocket-launching M-16s at the cost of schoolchildren. And certainly the gun rights movement, in making ambiguous statements after tragedies like the Columbine massacre and the Virginia Tech shootings, does itself few favors. A new book gives a 360-degree look at the movement’s views, which give basis to opinions of others, like Vice President Joe Biden (during a debate as he campaigned for President), who think some gun rights supporters need professional help. Scott Melzer’s Gun Crusaders: The NRA’s Culture War (New York University Press, 2009) offers one of the best contemporary subcultural studies available, about the NRA or otherwise. His study, the result of numerous interviews with NRA hard-core and general-support membership, is unlikely to change progressive or conservative perceptions of the organization or its participants. However, his excursions into this alternate universe, where gun control is seen as a left-wing culture war salvo in a crumbling society, are eye-opening explanations of the severity of these social schisms. Melzer conducted research at NRA events, finding interviewees among the true believers, as those who stood by the NRA on all issues and actively supported the group, to casual supporters, who attended an event because it was in the area, but might differ on some NRA topics. His subjects, by the author’s admission, were overwhelmingly white, male and conservative; he chalks this up to the NRA’s base (at one point, Melzer recalls being able to count the number of people of color among an attendance of thousands on just two hands). What brings them together is a unified vision of the world, one in which each is called on to save America from threats foreign and domestic. Such a vision is almost apocalyptic in its fear and seriousness, and must be acknowledged in the political discourse today. Most fascinating here are Melzer’s interviews, which paint a picture of white male views of American status, race and equality. Amid fundamental changes in the country, from immigration to global power shifts to Affirmative Action to feminism to gay, lesbian, bisexual and transgendered rights, the power, status, values and identities of white, heterosexual, middle-class men is seen as under attack. Melzer points out many interviewees see themselves as victims of liberal culture, marginalized second-class citizens who now come together as patriots, defending the last vestiges of individual rights and constitutional freedoms. On another level, Melzer delves into how differently liberals and conservatives see social development, and, more deeply, the clash over freedom. Liberals, he writes, see freedom from fear as an opportunity to thrive, while conservatives in this study resisted efforts to compel actions because they felt they personally were the best of judges of needs. These eternal differences between both political ideologies play how with firearms, but with the injection of lobbying money and elections, have far more deadly consequences. The belief systems of ‘gun crusaders’ is one in which they are being displaced by a society in which role expectations are not as clear-cut as they once were, and racial diversity, now forced through government regulation, has sealed a sense of losing the country. The solution to this societal shift? A return to frontier masculinity, which may take the forms of everything from public executions to violations of international law in pursuit on American interests. The so-called ’social terrorists’ who seek to undermine white, heterosexual men, in this climate, are empowering others to destroy the United States. For these patriots, gun rights are one of the last, but losing, refuges to what is left of America. Though not every firearms enthusiast’s perspective is nearly so bleak, Melzer provides a revealing look at how such views have shaped the gun subculture and inform the views put forward by the NRA itself. Gun Crusaders is engrossing. Those interested in the gun rights movement and gun lobby will learn a lot from Melzer’s research. Among some circles, Fred Hampton is a luminary without peers. Though new generations may only catch his reference in a song, his legacy in Chicago and to the Black liberation movement is without question. The charismatic Black Panther Party chapter leader demonstrated a natural gift for reaching people, and marshaled young people into political action for the first time. His brutal murder — in which Chicago police, after wounding him as he slept, delivered two rounds to the head, killing him — horrified the world. He was just 21 years old. The Assassination of Fred Hampton: How the FBI and Chicago Police Murdered A Black Panther is the account of attorney Jeff Haas’ fight to ensure justice for the families of Hampton and Mark Clark, killed in the police raid spun by authorities at the time as repelling a Panther attack. It is also a chilling chronicle of the depths authorities will sink to silence dissent and to cover it up. Haas and three other lawyers set up the People’s Law Office in 1969, and he defended many social justice activists since then. The Hampton case, however, drove Haas. It dragged on for years, facing defeats along the way, until a settlement. The book is as much about the commitment of scores of people, who poured in their time and energies to see that justice was done, as it is the quest to hold the police officers and establishment involved accountable. Subsequent investigations of Fred Hampton’s murder would reveal involvement by a Federal Bureau of Investigation informant and collaboration with local police that resulted in the organizer’s assassination. Few knew it at the time, but what occurred would be shown to be part of a sophisticated federal effort, labeled COINTELPRO, aimed at disrupting, demoralizing, dividing and exterminating Black activism primarily among social justice tendencies. It wasn’t until activists burglarized a Pennsylvania FBI office and released documents in 1971 that COINTELPRO was exposed. Operative William O’Neal, working through the bureau’s Racial Matters unit, provided key information just hours before the murder. His work, and the war the FBI waged on Black revolutionaries, figures prominently in the book. Those familiar with writings that trace legal trajectories will find The Assassination of Fred Hampton cuts a familiar path, yet one that takes on a particular heft given the case. The final days of Hampton’s life is imparted, but it is the excruciating detail with which the murder is told that is where Haas’ legal background brings the story out. Culled from volumes of testimony, research, released documents and other sources, Haas compares what happened with conflicting police testimony and justifications. His writing presents a penetrating image of law enforcement bent on protecting its own, even if some recognized the fault in their actions. Indirectly, the book shows the determination of the Hampton and Clark families as well as the legal team to counter the coverup in court and in the community. Though contemporary political movements in the United States have few comparisons quite like the Fred Hampton case in terms of severity today, Haas’ book is a primer on how a movement can challenge official misconduct through a diversity of efforts. The Assassination of Fred Hampton stands out, just as Hampton himself did all those years ago. Black Panther Party leader Huey Newton perhaps explained Black revolutionary nationalism best when he drew lines against what he called reactionary nationalism. Revolutionary nationalism is a force that sees capital and the ruling order in a fundamentally different way; rather than grouse over what piece of the power structure can be reformed or what privileges can be maintained, the revolutionary nationalist sees the challenge is in upending the dynamics as a whole. Though in some sense, the struggle of Newton’s day is gone, the spirit of what he envisioned has not disappeared from communities or consciousness. Be it noncooperation with police (a symptom of generations-old antagonism of the Black community by law enforcement) or local mobilizing for justice, resistance is alive as it ever was. However, with so many former radicals and intelligentsia invested in existing power via academia, grant cycles and so forth, a look at the grassroots social movements from which emerged Black internationalism is as exciting as it is instructive. From Toussaint to Tupac: The Black International since the Age of Revolution relays the story of Black anti-imperialism, a tradition explored exquisitely by Gerald Home among others, but rarely elsewhere in a method that frames the intellectual current as married to the upheavals of many periods. Edited by professors Michael West, William Martin and Fanon Wilkins, From Toussaint to Tupac transverses the histories of many important Black internationalist movements. The editors deliver a superlative recounting of history that organizers today should learn about and from. Of special note are the writings on transnational organizing among Blacks between the United States, Haiti and a constellation of African nations spanning centuries. Whether is was the impact of the Haitian Revolution on North American activism or exactly how profoundly figures like W. E. B. DuBois would shape political philosophy on global African liberation, the editors ensure they deliver a serviceable presentation of stories that have been, in some instances, told exhaustively. Elsewhere, the real treasures in this book are the details that convey to new students of Black internationalism how deeply embedded the struggle’s aspirations were to people most incorrectly do not associate with political activism. The spread of Pan Africanism in the early 1900s, in one passage, is traced back to sailors and international ship travel; those seeds would reach apartheid South Africa and eventually lend energy to the toppling of white rule across the country. Mahatma Gandhi’s association with Black struggles in the United States and elsewhere are sketched out as well. The editors do a solid job presenting Black internationalism in the United States as well. The influence of Black communists, particularly people like Harry Haywood and Claude McKay, on modern ideas of self-determination and racial diversity in white-dominated movements are weighty, and offered here. The Comintern’s involvement in drawing support for the Scottsboro campaign as well as agitating against the invasion of Ethiopia by fascist Italy are significant activist insurgencies highlighted with richness. From Toussaint to Tupac wanders into shakier territory when it comes to the spin on hip-hop. Utilizing an oft-repeated premise — that hip-hop traces roots to a mix of influences, from griots to Malcolm X — the book tries to close with a telling of the international (though less internationalist) reach and organizing potential of the music and culture. Fair enough, but following writings about the Black Panther Party and West Indian revolutionary fervor, the conclusion feels unsatisfying. However, in all, From Toussaint to Tupac is a good introduction to an overlooked history. A peculiar tension has always existed between activist educators working in public and higher education. Maybe it is the contradiction of cultivating consciousness of youth while being on the payroll of institutions (and certainly the state) that seldom believe in such politically minded pursuits. Or perhaps, as Luis Urrieta asserts in Working From Within: Chicana and Chicano Activist Educators in Whitestream Schools, it is the self-awareness of being essentially a tool for a system that wants to (and, in many cases, will) assimilate students into white-dominant mainstream America. What this means for Chicana/o teachers in the Southwestern United States, and the movements from which those teachers hail, is at issue for a subculture of educators. The tantalizing philosophical quandary Urrieta presents indirectly then is this: how much will students’ fates actually change through progressive educators on the tab of a system that, at best, wants to generally educate youth of color for ‘the future’ and, at worst, actively and systematically teaches versions of history that may swim against community self-interest? The challenges of navigating identity, alienation, politics and agency are tackled head on by Working From Within, a book that asserts a positive history to progressive Chicana and Chicano educators seeking to impart to young people a clear understanding of their roles in society as well as their history. Such relationships, particularly in academia, are fraught with compromises and negotiation. The book shares efforts to organize Movimiento Estudiantil Chicano de Aztlán (MEChA) chapters, youth leadership development, cultural studies and other tactics. Just as vigorous to the storytelling is a backdrop of educators conflicted about the positions they occupy and their efforts to maintain their idealism in a system that generally does not see the world as they do. Most telling about the involvement of progressive educators in academia is the ways definitions changed. Activism, in their lens, took on a postmodern feel, from community organizing and street actions to one in which they saw their employment as activism with a different scope, but lending to a social change few believed they would see in their lifetimes. Although one might say such a view could be a byproduct of Chicanisma/o and the complicated relationships it has had with white society for generations, it is doubtful such pretensions are isolated to Chicana/o instructors. 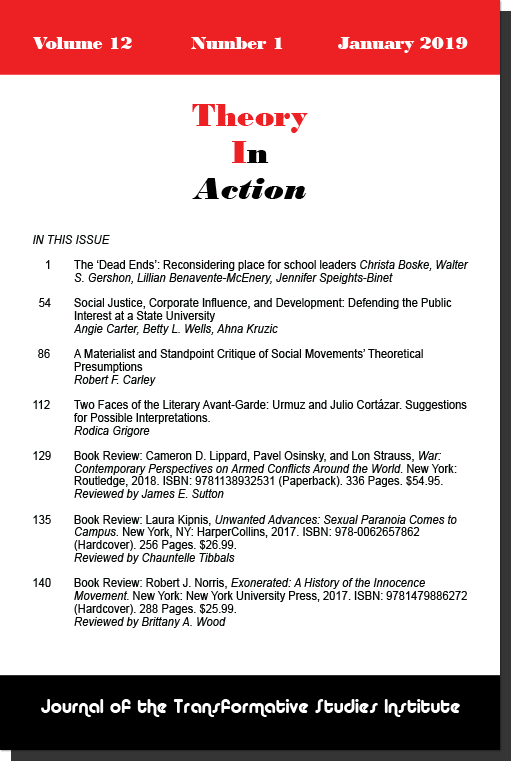 Other writings have criticized the tendency of those working in the academic and not-for-profit world to perpetuate themselves and their careers at the cost of serving the community, most visibly The Revolution Will Not Be Funded: Beyond the Non-Profit Industrial Complex by INCITE: Women of Color Against Violence. Implicit to the critique is that, by buying off good organizers with jobs and lifestyles oriented in some way around their views, the struggle becomes not one of community building but ensuring those views have a home (and thus acculturated by some part) in the institution itself. By creating that space, one may win a victory in putting views forward, but ultimately it is argued that mainstream education wins because its own notions of academic freedom and discussion are reinforced. In Urrieta’s view, such changes are emblematic of how movements grow and change over time. Unexplored is how militant Chicana/o activism has mostly vanished amid the rise of mainstream social action and nonprofits. It is debatable how good or bad the developments such movements have seen ultimately will be, but Urrieta’s research certainly ads more to an ongoing conversation.